One of Mayor Michael Bloomberg’s initiatives among many in his PlaNYC effort in 2007 was to have every New Yorker living within a 10-minute walk of a park or playground. In 2013, the Department of Health and Mental Hygiene (DOHMH) asked participants in the Community Health Survey if they had exercised at all during a seven-day period. 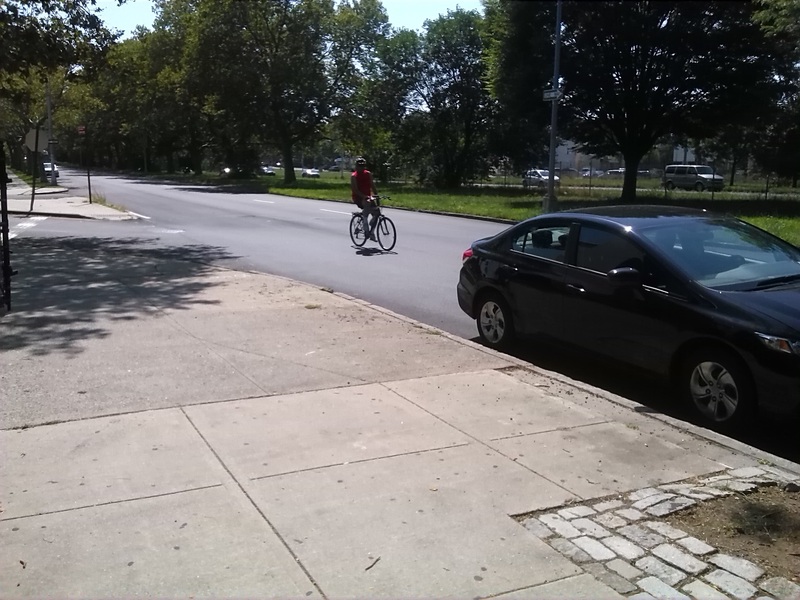 People in Eastern Brooklyn and Southwest Queens did not exercise enough despite being next to the Jamaica Bay Greenway and Highland Park. The community may not have adequate facilities or may discouraged by a range of factors, real or perceived, in the environment. According to the same 2013 DOHMH Community Health Survey, 30% of Brooklyn and 35% of Queens is overweight and (27% and 19% is obese respectively). The distribution of overweight and obese adults is not equal; Southern Queens has a large concentration of overweight adults while Eastern Brooklyn has a high incidence of obesity. Much of the further reaches of Queens have a land development pattern unlike other parts of the city like Midtown Manhattan or the parts of Queens that are close to the subway. 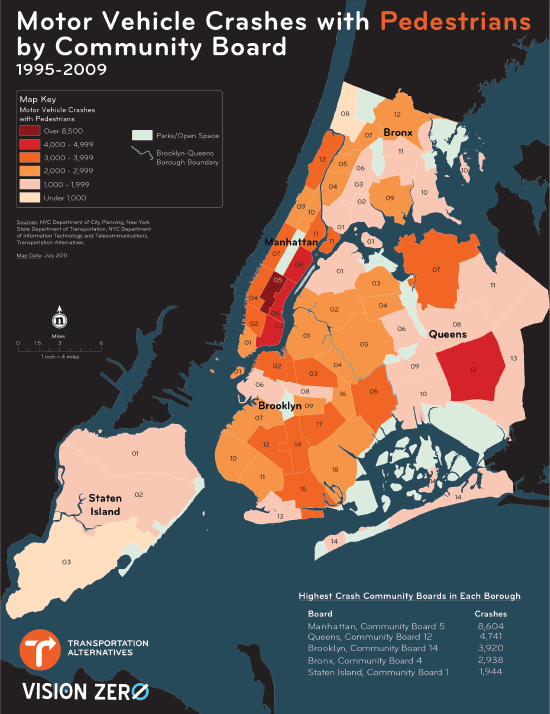 In fact, Southern Queens is predominantly suburban. This car-centric design typical of the 20th century features destinations, including gathering places and play space, that are beyond a convenient walking distance. The streets themselves are designed for efficient movement of vehicles, which often means wide streets that induce speeding, long crossing distances, and uncomfortable, restrained sidewalks. As a result, drivers of cars and trucks kill hundreds of people every year citywide, and injure thousands of others. Some are on a bicycle, but many are people on foot using and crossing the street. In 2011, Queens Community Board 12, covering areas like downtown Jamaica, South Jamaica, and St. Albans, came in second citywide for most pedestrian deaths by community board, according to a report by Transportation Alternatives. According to the Department of Transportation, from 2010 to 2014 there were ten people killed or severely injured between Atlantic and Sutter Avenues, and vehicles frequently exceeded the 40 MPH speed limit. This exacerbates the accessibility of limited existing open spaces by turning every intersection into a stressful experience, which clearly is not friendly for families, children, or anyone with physical impairments. The afterthought of safety for people on foot extends to those on bicycles. The few available bike lanes serve no one except riders already comfortable riding in traffic, since the lanes are unprotected and disconnected. Except for two short and adjacent but disconnected stretches of greenway by Rosedale, there is nowhere to ride a bicycle safely. All of the available bike routes, represented by the green, blue, purple, and peach-colored lines. Living far from quality, affordable rapid transit (notably, the subways) does not make matters easier, and that’s besides the neglect that the subway system is currently suffering. A trip to anywhere starts with the local bus, and those have their own set of problems. The gray circles highlight the railroad stations in the area, and the gray arrows point to the furthest reaches of the subway. This is New York City’s Queens bus map for May 2018. Click it to expand. It’s easier to reach one of the six Long Island Rail Road stations aside from Jamaica. But the railroad is expensive; in 2017, the one-way price of $7.50 ($10.25 during rush hours) to reach Penn Station puts a speedy half hour trip out of reach. In June 2018, the Atlantic Ticket made it possible for people using those six stations to go to Brooklyn for a flat $5 a ride or $60 a week. But this still prices out low-income people who struggle to pay $2.75 a ride or $32 a month for the buses and subways. In response to some of these issues, we believe a greenway is not only proper and appropriate for neighborhoods in Southern Queens; it’s something its residents deserve and will benefit from.